"Everything was well-coordinated. 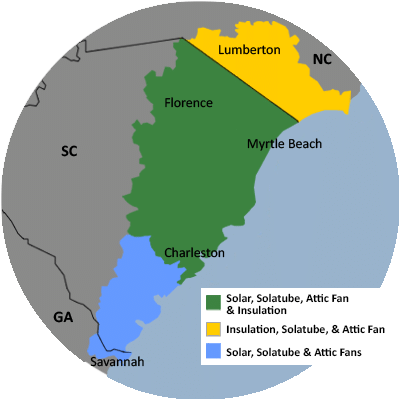 The follow-up and..."
"The installer of our hybrid water heater, Ike, was more..."
For a FREE no-obligation estimate in Murrells Inlet, SC, please fill out the form to the right and Carolina Energy Conservation will contact you shortly. We just moved into a home last week and the spare bedroom is quite cold. The HVAC has been looked at and is working great but we were told the room has poor insulation. I'd love someone to come take a look and price the insulation for me. I look foreword to hearing from you. Thank you! Looking into the possibility of adding solar panels to reduce electric costs and in the event of power outage. Tremendous heat build-up in attic. Portions of previous plastic sheeting has become displaced and requires replacing. Probably original to house built in 1985. I want to keep my attic cool in the summer so HVAC runs more efficiently. Interested in possibly adding more blown in insulation and adding radiant barrier. The installers at Carolina Energy Conservation worked quickly and cleaned up everything, As a company they were nothing but true professionals! Thank you. Looking to experience additional comfort and energy savings in your home? Carolina Energy Conservation can provide you with a home energy audit to discover what work needs to be done. We offer these services to residents of Murrells Inlet and nearby. We perform a home energy audit before we make any recommendations about improving insulation and air sealing. Once the evaluation is complete, we take the time to sit down with you to discuss the results and help you make the best decisions for you home and family. Get a FREE Home Energy & Insulation Consultation! This 40 year old insulation has compressed over time, causing air to flow easily through it. CEC sponsored the shelter's table at this event! Located right along the beach, these panels get TONS of sunlight throughout the day. Frozen water pipes in master bath shower. i may need more insulation. Going to enclose my back porch into another room for us. Heated and with ac. The ceiling above need blown in insulation. Located in parmelee. We want to install a Solatube in our condo, but will need HOA-ARB approval before installation can begin. We would like a consultation and estimate this coming week, 11/27-12/1. We have 2 bedrooms above our garage that get extremely hot in summer and cold in winter. We would like to get an estimate on insulating that area better. Thanks! !